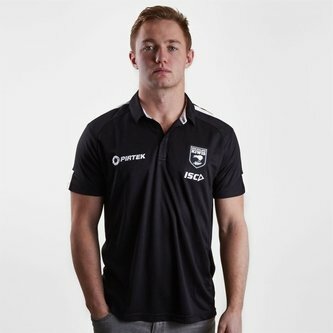 Show your pride and passion for the Kiwis when you pull on this New Zealand Kiwis 2018/19 Players Performance Rugby Polo Shirt from ISC. The New Zealand national rugby league team, also known as the Kiwis, has represented New Zealand in international rugby league since 1907. The New Zealand Kiwis are currently second in the RLIF World Rankings. A New Zealand side first played in a 1907 professional rugby tour which pre-dated the birth of rugby league football in the Southern Hemisphere, making it the second oldest national side after England. New Zealand has competed in every Rugby League World Cup since the first in 1954, reaching three consecutive tournament finals between 2000–2013. In 2008, New Zealand won the World Cup for the first time. This tee is a classic polo as it has a 3 button placket and collar whilst coming in a regular comfortable fit. Sticking to tradition it is black with the ISC and team logo on the left side of the chest whilst the sponsor - Pirtek - is on the right.